Dog strollers might sound like a silly concept, but the truth is that they can save your dog a lot of discomfort. If you have a dog that can’t keep up with their normal exercise routine due to age, illness or some other reason, you should consider investing in a high-quality stroller so that they can still enjoy fresh air and sunshine. Choosing the very best dog stroller is important, but there are a lot of factors to consider. This review will simplify the whole process by helping you target the most important criteria for picking out a great stroller for your dog. While the idea of a dog stroller might seem strange at first, the reality is that they can be a life-changing device for many pet owners. Before pet strollers came around, dogs with mobility issues were limited to hanging around the house. With a pet stroller, you can take your dog practically anywhere regardless of their health. Contrary to popular belief, dog walks aren’t just for exercise and elimination. Mental stimulation and fresh air are both crucial to your dog’s well-being. Senior dogs: Most dogs become far less active when they reach old age. They become unsteady and have trouble walking or standing for extended periods of time. Eventually, your senior dog may be unable to walk around the block without taking a long time and being in pain. Dogs with joint problems: If your dog has arthritis or other joint issues, even a walk of normal distance can cause them pain. 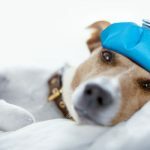 Most dogs naturally want to get out and see the world, but for dogs with joint issues, walking by foot can prove to be difficult — not to mention dangerous. Overweight dogs: While you work on getting your overweight dog back into good shape, a pet stroller can keep their brains active and their moods high. Post-surgery: Otherwise healthy dogs may become temporarily immobile while recovering from surgery. In that case, a pet stroller can be your dog’s best friend while they wait to get up and moving again. 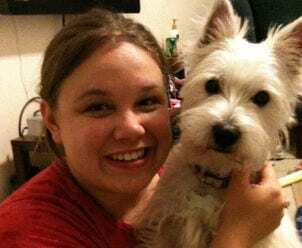 Agoraphobic or anxious dogs: Some dogs are deathly afraid of being outside. They may fear people, cars, loud noises or simply the sensation of being in an unenclosed space. These dogs can nonetheless enjoy going on adventures with their owners by using a pet stroller, which gives them a sense of safety. Long distances: Want to go on an extra-long run or hike, but not sure if your dog can keep up with you the whole time? Using a dog stroller gives you the option of going further than before, since your dog’s tiredness won’t pose an issue. Quiet resting spot: Similarly, all dogs can use a private-feeling, quiet resting spot. Whether they’re fatigued due to being overstimulated or physically tired, they can seek refuge in their stroller. Dog strollers all fall into a few basic types based on the type of dogs they can accommodate. Make sure to consider whether or not your pet will grow in size in the near future. These strollers are compact and easily stored. They’re the perfect size for a small breed to curl up into, with plenty of space remaining to move around. These strollers are ideal for toy breeds and miniature breeds, like Yorkies and Chihuahuas. Medium strollers are ideal for dogs up to 30-45 pounds. They’re not too small and not too big. You could also fit two smaller dogs into a medium-sized stroller. These strollers are the largest of the bunch. Some can fit dogs up to 100 pounds, so they’re quite roomy and bulky. Make sure to choose a sturdy, durable stroller for dogs of this size. You can also use a large stroller if you’re traveling with two or more dogs at once. Wheel type: This is an especially important consideration because the type of wheel on your dog stroller determines the type of terrain that you’re able to use it on. Some strollers have real air-filled tires, while others use plastic wheels. You can also choose between a 3-wheel and 4-wheel model. Closure type: Many strollers use zippers, while others have other methods of opening and closing. Viewing panel: Most strollers include a mesh-covered panel for dogs to look out of during their walk. Some, however, are open at the front with no mesh, while others afford your dog a side view. Foldability: Space is at a premium in most people’s homes. One of the biggest barriers to having an extra stroller around is likely the amount of space that it takes up, but foldable strollers largely avoid that problem. You can stick them into a closet or in the trunk of your car when they’re not in use. Weight: You’ll often have to carry your stroller short distances, and you also have to push the weight of the stroller whenever you push your dog. An extra-heavy stroller can be so cumbersome that it renders itself useless — the point of a stroller is to make your life easier, not harder! A lightweight stroller is always the best bet, as long as it’s also sturdy. Durability: After all the time and money that you spend on a dog stroller, you absolutely don’t want to have to start the process all over again in a few months’ time. The best pet strollers are able to withstand the test of time, even when used frequently. Weather-readiness: Consider the typical weather in the area where you live, as well how frequently you plan to use your stroller. 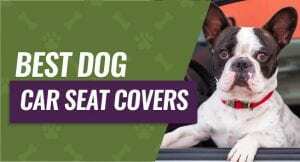 If you expect to need to use it during wet weather, you’ll want to spring for a model with a protective barrier to protect your pooch from getting soaked. Weight limit: Don’t just buy a stroller of a certain size and assume that your dog will fit into it. Look up the weight limit, and keep in mind that you may be adding items onto the stroller for storage during your walk as well. 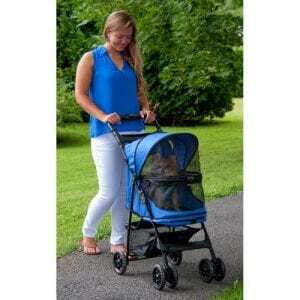 We love this Promenade Pet Stroller because it’s versatile enough to be used for most pet owners. 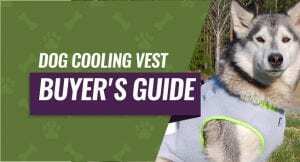 It can hold up to 50 pounds of weight, so it’ll work for either small or medium dogs with plenty of space inside to move around. One perk to this stroller is that the mesh panel can be completely removed. On sunny days, your pet can enjoy the fresh air without fabric getting in the way. If your pet is prone to jumping out, however, you can zipper them in with no problem. Zipper closures aren’t the most convenient, but this model uses durable materials so that you’re unlikely to come across issues using the zipper. The Promenade has plenty of storage for extra items, and the mesh panel on the back means that you can access your dog quickly to offer them treats or reassurance during your walk. It also means that your pets can easily look up at you. This stroller is easy foldable to a compact size for storage or travel. It’s easy to set up and use, and it’s lightweight. Users say this stroller feels sturdy and long-lasting. It’s spacious enough that you can fit multiple dogs in it if necessary. It’s easy to maneuver, and the wheels easily lock for safety. People who use this stroller don’t seem to have many complaints, which is why it’s our top all-around pick. Some small cons mentioned by reviewers include the fact that the cushion inside isn’t the most comfortable or fluffy, and the wheels sometimes squeak during use. Other than that, this stroller is a wonderful value. It’ll work for a variety of dog breeds and last for a long time. The Happy Trails stroller manages to meet all of the most important criteria: it’s affordable, well-made and easy to use. It can accommodate up to 35 pounds of weight, so it’s great for dogs that are on the small end of the spectrum. This stroller uses a “no-zip” design so that you can easily carry your pet into and out of the stroller without fussing with a zipper. There are 4 wheels designed for a variety of terrain, and there’s convenient storage space underneath. The mesh viewing panel is huge, so your pup can see out of all sides during your walk rather than only being able to see through the front. It’s spacious enough inside that your pet can lay down, stand or sit while still being able to see. There is a soft, thin pad inside. The material is water-resistant, so you don’t have to worry about getting caught in a shower unexpectedly. Users say that this stroller is ideal for smaller dogs. It’s easy to assemble, sturdy and lightweight. Importantly, it’s also easy to fold for storage. On the other hand, reviewers note that the stroller isn’t ideal for moving at a fast pace, since the wheels will start to wobble. For a better jogging stroller, choose one that’s designed for that purpose. Overall, this stroller is a great value for the price. The Expedition pet stroller from Pet Gear is one of the few strollers that can fit dogs up to 150 pounds. 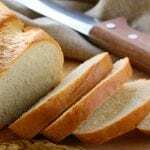 With such a high weight limit, it’s perfect for large breeds like Labrador Retrievers, Pit Bulls and Border Collies. This stroller is lightweight for a stroller with such a high weight limit. It’s just 33 pounds. It features Air Ride tires, which are great for longer walks and rough terrain, so you can take your pet all around town. Importantly, it’s a breeze to fold the stroller up for stowing away. Setting it up for a ride is also easy and quick. The Expedition has one large internal compartment, and the mesh covers all 3 sides for your pet to look at their surroundings. There’s a pad inside for extra comfort, which is easily removable when you need to clean it. Some pet owners note that the opening is a bit too small for extra-large breeds. In addition, users with large dogs report that their dogs have trouble turning around inside due to the dimensions of the stroller. For those reasons, we don’t recommend this stroller for dogs above 100 pounds with long bodies, such as German Shepherds. This stroller isn’t waterproof, so it’s not ideal for all weather conditions. 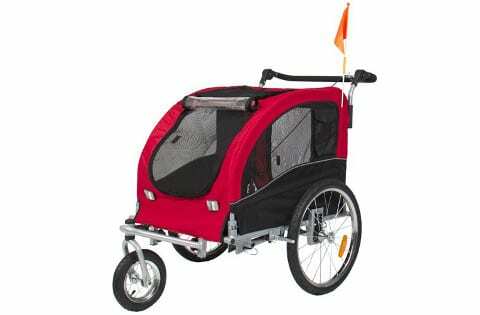 However, it’s great for people who want a roomy stroller that will fit one large dog or multiple smaller ones. If you have multiple dogs, you can simply buy a large-sized stroller that will accommodate all of their weights, but often it’s easier to buy a stroller that’s especially designed to fit two dogs. This OxGord stroller is our favorite pick because of its durability, ease of use and convenient design. Rather than one large compartment, this OxGord stroller has 2 separate compartments with a total weight limit of 55 pounds. The compartments are each roomy, and each dog has a front-facing mesh panel for sightseeing. 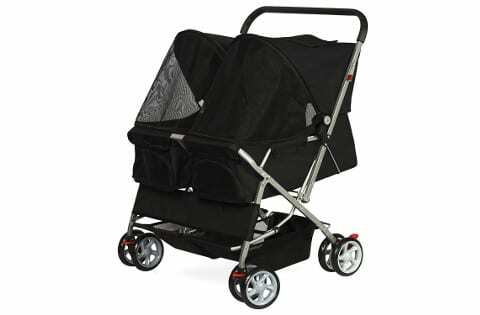 The stroller is fairly lightweight despite its large size, and includes plenty of storage for personal items. If you have more than 2 dogs, you can also put two into one compartment as long as the total weight remains under the limit. Some dogs don’t appreciate being crowded into one space, so having the option to split them up is very useful. This stroller folds up easily, though users note that it is bulky due to the large size of the stroller. Similarly, other users have found that it doesn’t fit through certain doorways because the wheels are too far apart. However, most reviewers have found those to be fair trade-offs for the spaciousness and easy set-up. This is a 4-wheeled stroller, and the wheels themselves are sturdy and stable. However, they’re not suitable for rough terrain. Keep this stroller on paved, urban areas for best results. Many pet strollers that claim to be designed for jogging aren’t actually ideal for that purpose. They’re too bulky, or the rear axle gets in the way of runners’ feet. This stroller from Best Choice is a different story. This stroller can be used as a 3-wheel stroller or as a bike trailer with an easy and quick conversion. The stroller has an impressive weight limit of 66 pounds, and is fairly lightweight itself at 37 pounds. It may add an extra challenge to your run, but once you get going it’ll be a smooth ride. 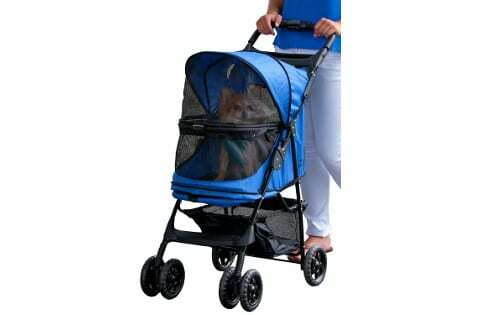 With mesh panels on all sides of this stroller, your dog will be able to gaze out at the trail during your entire jog. The stroller is easy to steer with a hand-lock brake system. Users find that this stroller has plenty of room inside for their dogs to get comfortable. It’s sturdy and durable, and dogs love that they can see easily from inside. On the other hand, this stroller isn’t the easiest to transport from place to place. It does fold up, but getting it into a car requires disassembling the wheels. 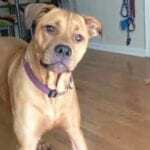 Reviewers say that this is a quick process, but it does add an extra step that some pet owners may not appreciate. Reviewers of this stroller also say that it moves quietly and smoothly, so you don’t have to worry about wobbly wheels. However, because there’s only one smaller wheel in the front, dogs may cause it to tip over if they put all their weight on the back end, so you shouldn’t leave your dogs unattended in this stroller. 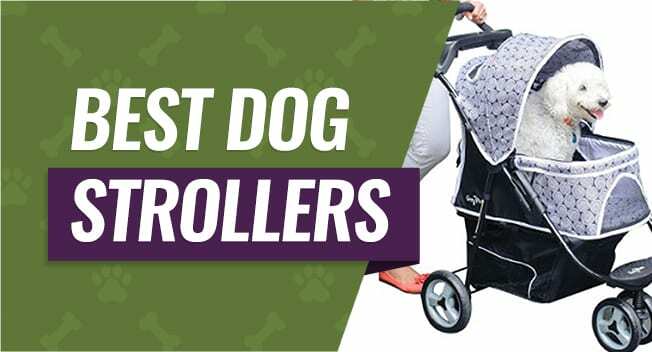 These dog strollers are all wonderful choices, but which one stands out among the rest? The Promenade Pet Stroller is our pick for the best pet stroller of the bunch. The Promenade shares many of the benefits of the other strollers — it’s durable, easy to use and comfortable — but it also has far fewer complaints from users about little issues like bulkiness or wobbly wheels. That makes it a dependable, reliable choice.